So Hooray for Ole Miss? Thank God Ole Miss has a pregnant 16 year-old pseudo-celebrity on its side. And wait, is that a GED textbook in her little maternal mits? Why yes it is! Perfect. "I haven't thought anything about what I might study," she has said. "I'll have to look more into that. But if I went anywhere, I think it would be fun to go to LSU." Is anyone else confused? I guess confused is what being 16 and pregnant is all about. That or dumb (maybe that's where the GED comes in). Little Jamie Lynn is damn right "it would be fun to go to LSU," if by fun you mean conducting The Train at the DKE house. The last thing this girl needs is "fun." 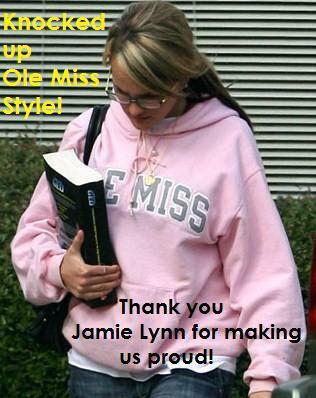 Stick to Ole Miss, Jamie Lynn. You never seem to see pregnant girls at Ole Miss. Maybe next time K-Fed and his 4 kids could do the Jumbo-Tron Hotty Toddy for the Rebs, or possibly Lindsey Lohan could "get caught" at Bungalow 8 snorting a line of blow with Eli. The promotional possibilities are endless. What better way to reach America's youth? Forget "US News and World Report"...Ole Miss is all about "US Weekly."